Sometimes, the planets align. Sometimes old friends come back to Paris (hi Tory!) and sometimes new friends come back to Paris (hi Sarah!) and sometimes you go to dinner at a restaurant about which you’ve all heard loud and exuberant whispers. It’s never ideal when two people order the same dish – there is so much to try! – but the heart wants what the heart wants (or in this case, the stomach) and so I generally let it slide. But once in a while the planets actually do align and you find yourself at dinner with old friends and new friends and everyone independently decides to order something different and everyone chooses the very dishes you yourself were trying to decide between and you all agree on the wine, too, and then you just know. You just know. The other night was one of those magic nights. The players: Tory, Sarah, and myself. The setting: le Bistrot Paul Bert, a cozy restaurant tucked in the 11th off a metro stop – Faidherbe-Chaligny — where I somehow never have reason to go. The décor: mirrored walls, eclectic art, tiled floors, roving chalkboard menus. The tables are quite close to each other, but what better excuse to inspect the meals of your neighbors as your labor over your own decision. And what a decision! 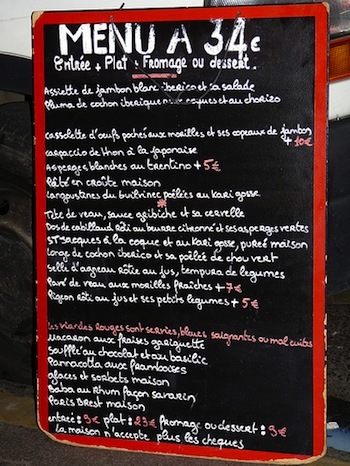 The 34-euro, three-course menu – all in French – is heavy on the meat. The wine list is extensive, though not suffocating. The bistrot also offered about a dozen vins du mois. We shared a bottle of white Bourgogne that was sweeter than expected, but not overwhelmingly so. The noix de St. Jacques seemed to be a popular entrée, but we opted for starters slightly more decadent: a feuilleté with escargots and champignons des bois swimming in cream; the smoothest most beautiful foie gras with chutney; and a terrine de campagne that melted in my mouth and paired quite nicely with the balsamic dressing of the side salad. We each sopped up the remaining flavors on our plate with hearty brown bread. On to the plats: for Tory, a dos de lieu – a man-sized filet of white fish sitting next to a heaping pile of champignons des bois; for Sarah, a glass of red and a pot au feu that was chock full of tender beef, potatoes, turnips, leeks, carrots, and even a fist-sized piece of marrow; and for me, grilled squid, chewy and succulent all at once, served with roasted red peppers. The portions were surprisingly generous (this is France, after all), and after two courses we were stuffed and happy. But dessert! Dessert! Soufflé, lemon and currant sorbets, and the specialty of the maison, a Paris-Brest. I had never seen one before, but it was a giant puff pastry filled with an airy chocolate-hazelnut cream. After such a meal, coffee was a must. There was even talk of Calvados and a trou Norman. We left the restaurant on a cloud. A few notes: all of our choices were fairly traditional and non-experimental, but the simple flavors did their job remarkably. 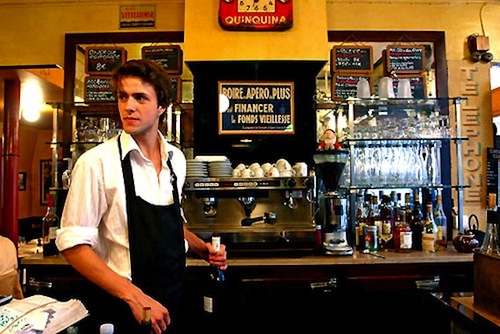 The clientele was mostly French-speaking, perhaps regulars. The wait staff was attentive but not overbearing. All in all a lovely Wednesday evening meal, and a new must in the classic bistrot category. I will certainly be back soon. Written by Simone Blaser for the HiP Paris Blog. Looking for a fabulous vacation rental in Paris, Provence, or Tuscany? Check out Haven in Paris. I’m so excited to happen upon your site – I’m leaving for Paris in a couple of weeks with friends & am definitely going to add Paul Bert to the list. I’m assuming reservations are a must, right? Not to be too picky, but Paris Brest is made with pate a choux, not puff pastry. Puff pastry is that flaky stuff used for Napoleons and the like. Pate a choux is for “cream puffs” and other pastries, typically stuffed with “creme patissiere”, which is what Paris Brest is classically stuffed with. At the risk of sounding silly, I think I’d love to visit Bistrot Paul Bert for the gorgeous waiter pictured in the first photo as much as for the delicious food! 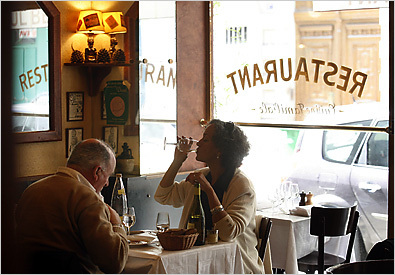 I’ve been hearing (and reading) wonderful things about le Bistrot Paul Bert lately. I’ll have to make it a point to enjoy a meal there later this year when I return to Paris. How lucky you are to live in such a wonderful city.